I approach All Out War a little nervously. It has had great reviews, but Tim Shipman’s previous stint at the Daily Mail concerns me: you don’t get and keep that gig while taking a neutral stance, especially on matters EU. But Shipman’s Tory contacts, meticulously cultivated, are solid gold when it comes to telling this particular tale. The referendum campaign crossed lines of party, class and background, but the centre of gravity – and the centre of the story – remained firmly on the right. Besides, Shipman assures us at the beginning that he will be even handed, and who wouldn’t trust a journalist? If journalism’s the first draft of history, then this is a great account: vivid and energetic with a relish for drama. We find ourselves across the table from Gove and Johnson as they plot, have a ring-side seat at the metaphorical punch-ups between Banks and Elliott, yell impotently at Cameron and Corbyn. There are plenty of revelations and we learn why people acted the way they did: there is plenty of principle and plenty of low politics. Ukip think that Vote Leave are a pro-EU conspiracy. Jeremy Corbyn’s office think that early meetings are a conspiracy against their fragile leader. I come away from the book with a renewed sense of loss and frustration. I’m surprised and a little disappointed that my views of most of the main characters have not changed (though see below). I guess a Leaver, reading the book, would similarly find themselves rooting for their guys throughout. Perhaps that proves Shipman’s even-handedness. It is hard not to conclude that much of the responsibility for Brexit lies with David Cameron. It was he who since 2005 had prepared for the referendum by – deliberately or not – antagonising the Tories’ sister European parties, bashing ‘Brussels’ for an easy gig, mismanaging his party, setting the wrong strategy for the referendum campaign, securing what too many people dismissed as a rubbish deal, vetoing decent cross-party ideas, and assuming that the electorate would back him anyway. There’s much talk of his ‘country before campaign’ behaviour by which he tied his own hands for reasons of statesmanship, but this is cancelled by a kamikaze policy of refusing blue-on-blue attacks yet at the same time riling the right of his party. At the same time, if you were a Labour remainer, I can almost guarantee that you will not be a follower of Jeremy Corbyn’s inner circle after reading this book. The book reminds us that Remain always had a far harder job to win than was popularly thought. Yet a win for Leave was not assured. There were plenty of occasions where a different call or a different throw of the die would have eaten into that 1.3 million plurality. Shipman himself seems convinced (and is convincing) that the contribution of Dominic Cummings was pivotal, and Cummings’ survival of a farcical coup attempt at Vote Leave may well have been the turning point of the campaign. In a book of this nature, we want to find ourselves thinking differently about the key players and though – as I’ve said – I found most of my preconceptions cemented rather than changed, I did find myself rather more intrigued than before by both Cummings and the Eurosceptic MP Steve Baker, in Cummings’ case to the extent of reading his 20-odd thousand word blog. I think this is a fine book, and it is required reading for anyone who is interested in campaigning or in the future of the UK. It is not perfect, however. There are some individuals about whom I’d have liked to have read more – Vote Leave chair Gisela Stuart, for example. The (very interesting) psychological assessment of Michael Gove’s personal struggle concludes that Gove chooses to be loyal to his father rather than his boss, but the story about Gove senior’s fishing business (supposedly destroyed by the EU, but possibly not) is presented confusingly. More seriously, there is an elephant in the room: the media. Shipman mentions in a number of places that Conservative Remainers simply weren’t used to facing a barrage of negative press day after day. But Shipman was himself – when at the Mail if not at the Sunday Times – part of that machine. It is disingenuous to report on the role of the BBC but not the highly partisan print media. Paul Dacre, Tony Gallagher, Rupert Murdoch: all these were participants in the same way as Will Straw or Paul Stephenson. Sarah Vine’s famous email to her husband about Murdoch and Dacre’s views of Johnson as potential PM is a great illustration. Of course, Shipman reports on politics and not on the media, so perhaps this is an understandable omission, but omission it is. 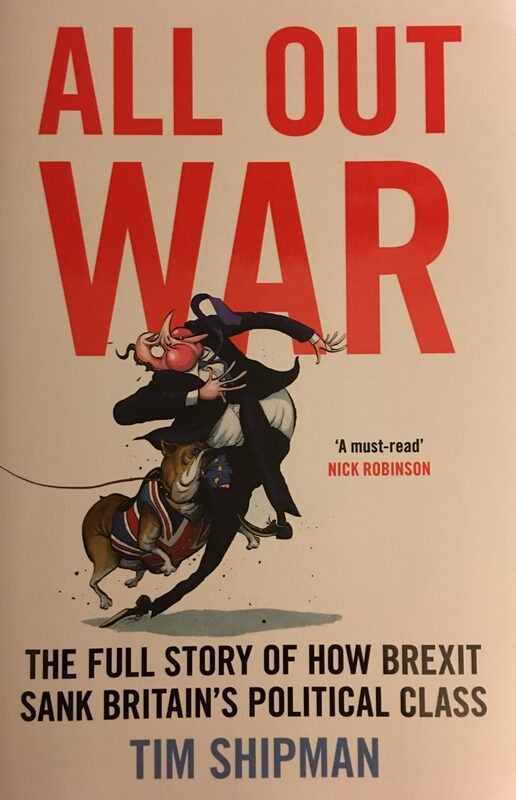 For those of us who supported the Remain cause, All Out War is pretty gloomy reading. Will Straw is probably right to argue that an overtly-positive case for the EU would have failed more dramatically, but that doesn’t mean that next to no positive case should have been developed. (This blog did attempt one, very late in the day.) There are lessons now for the 48% whose anger and sadness have been too slow to metamorphosise into strategic thinking and the formation of clear objectives. Reading this book can and should be an essential part of the grieving process. I agree with most of what you say about this book – it’s great on detail, yet flawed on the bigger picture. But I felt that with people like Cummings, Baker and so on, Shipman seemed to be a bit dazzled by hindsight – obviously in retrospect, these people look like they called the vote exactly right and did all the right things, but the book also shows the referendum could easily have gone the other way if Remain had been more effective (and then no one would be going around saying how clever the leaders of Leave were). I watched Cummings give evidence to the Andrew Tyrie’s Select Committee as he attempted to defend the £350 million claim. He talked a lot of nonsense about how we could save “billions” from scrapping public procurement rules after Brexit. But there’s no way that will happen, because it would mean contracts worth very signifiant sums being entered into between government and the private sector with no proper process or accountability – added to which, UK businesses would lose access to overseas public procurement markets. It was just as big a lie as the £350 million, only on a more boring topic (and sadly the MPs didn’t really take him to task on it). He clearly didn’t care about the evidence for what he was saying – he was convinced he was right and regarded anyone who disagreed with him as an idiot. As for Gisela Stuart, I agree it would have been interesting to know why someone who (to my mind) has always come across as quite reasonable on most things I’ve heard her talk about could get comfortable about campaigning alongside such a thoroughly unpleasant and untrustworthy bunch of ideologues! Thanks Paul. I think you’re right that the book does show that this was a referendum for Remain to lose…but we did. Leave needed all the cards to fall their way but as much of that was down to the incompetence of Cameron and co than to any cleverness on the Leave side. I remember Cummings’ performance in front of the Treasury committee – I thought that no one watching that could have been converted to his cause. But I guess the undecided weren’t watching, and Cummings (and Elliott) knew that. That’s the bit that Remain continue to get wrong. Sounds good. I’ll wait for the paperback edition, due in May. This entry was posted on 30 January 2017 by Cafe thinking in Blogging 101, Book reviews, Brexit, Politics, Reviews, Strategy, Uncategorized and tagged All Out War, Brexit, David Cameron, Dominic Cummings, Jeremy Corbyn, Remain, Steve Baker, Tim Shipman.